There sure has been a lot of discussion about flags lately. Flags that are appropriate to fly. Flags that need to be changed due to geopolitical shifts. Flags that represent pride. But most flags are actually horrible, from a design perspective. Specifically: Most city flags are essentially barf on fabric. Radio host Roman Mars is one of our favorite design thinkers; we often syndicate his show 99% Invisible right here on Gizmodo. This year he did a TED Talk on the topic of vexillology—the study of flag design. Not that there aren’t a lot of good flags out there (and some of the “worst” flags, from certain ideological perspectives, are also the best-designed ones). But Mars is right in that the very worst offenders are at the city level. We’re pretty familiar with state flags, 50% of which are completely awful, and the rest are just boring. A few are okay, like Texas. But for a true reality check when it comes to vexillological evils, I encourage you to take a deep breath and bravely look up your city’s flag. Until recently, I had no idea that this abomination flew over my town. It has great intentions, and some awesome graphic action going for it with those serrated edges. BUT THAT SEAL THAT UNGODLY SEAL. It has flags within flags within flags like some kind of vexillology-trained neural network. 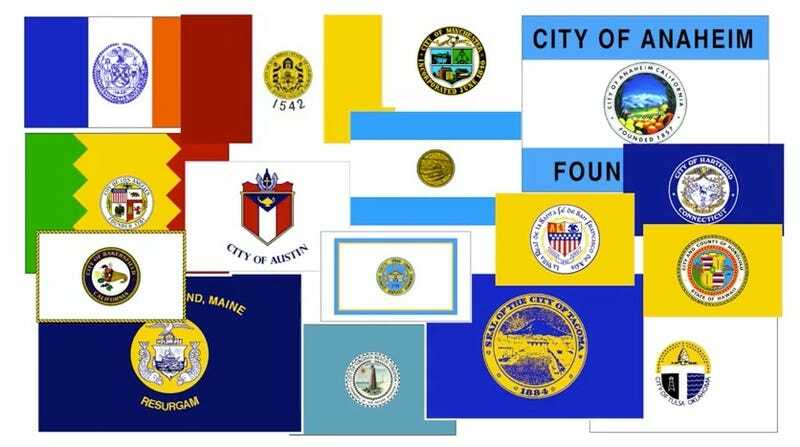 Let’s unearth some of the worst offenders when it comes to city flag design. Yes, you can proudly let your city’s awful flag fly here. But we’re also looking for some really obscure horrible city flags. And yeah, we’ve seen seen the “friendly wrestling match” that two people are engaged in on the inherently racist Whitesboro, New York flag. So don’t send us that one. Besides, it probably won’t be too hard to find one that’s worse. Are These The Ugliest City Flags on Earth? Which One of These Flags Should New Zealand Pick?